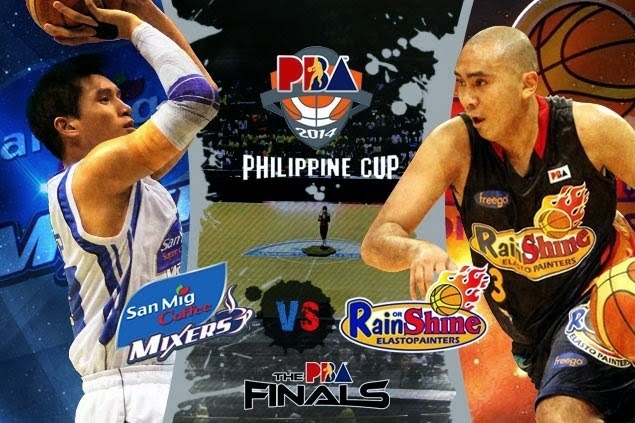 Game 3: Rain or Shine vs. San Mig Coffee Live Updates, Scores - PBA PH Cup Finals 2014 - Balita Boss! The Rain or Shine Elasto Painters and San Mig Super Coffee Mixers split the opening two games of the 2014 PBA Philippine Cup Finals. With the series even at 1-1, Game 3 is set for today. Jeff Chan misses long trey; San Mig Coffee wins. SAN MIG 77-76 RAIN OR SHINE - 10.6 seconds remaining, 4th Quarter. SAN MIG 77-76 RAIN OR SHINE - 1:24 remaining, 4th Quarter. SAN MIG 77-74 RAIN OR SHINE - 2:59 remaining, 4th Quarter. Devance's shot makes it a 3 point game. SAN MIG 75-74 RAIN OR SHINE - 3:27 remaining, 4th Quarter. SAN MIG 73-74 RAIN OR SHINE - 4:15 remaining, 4th Quarter. Rodriguez hits baseline jumper as Painters gets back the lead. SAN MIG 73-72 RAIN OR SHINE - 4:15 remaining, 4th Quarter. Mallari gives Mixers the lead. SAN MIG 71-72 RAIN OR SHINE - 4:59 remaining, 4th Quarter. SAN MIG 69-72 RAIN OR SHINE - 5:24 remaining, 4th Quarter. SAN MIG 69-70 RAIN OR SHINE - 6:24 remaining, 4th Quarter. Reavis makes it 1 point game. SAN MIG 67-70 RAIN OR SHINE - 6:54 remaining, 4th Quarter. SAN MIG 65-70 RAIN OR SHINE - 7:29 remaining, 4th Quarter. SAN MIG 65-68 RAIN OR SHINE - 8:10 remaining, 4th Quarter. Mixers within 1 after basket from Sangalang. This time Sangalang gets the basket and a foul, but misses also the FT.
Barroca gets the basket and a foul, but misses the FT.
Big Game James with the step back triple. Lee answers with his own trey. Yap hits long two points. Amazing move with two points for Lee. Two-for-two for Devance in FT.
Chan and Lee scores; Lee with already 16 points. Jervy Cruz scores. PJ Simon answers. Back-to-back three from Simon and Alex Mallari; 8-0 run by San Mig before halftime break. Mark Barroca beat the 24 seconds. Fancy pass from Devance which resulted to turnover. Same score. Belga foul and a basket. Devance hits trey; Chris Tiu scores. Larry Rodriguez nice fake and finishes with a layup. Rodriguez steps back for a jumper; Chan hits two free throws. Sangalang hits a layup off the glass. San Mig with another offensive foul. Third OF of the night. Jeff Chan gets the layup. Simon scores, but Cruz answers then Sangalang scores inside. Lee hits a triple and a layup. One-handed shot and two points by Pingris. Side step and a layup by Quinahan. Yap pulls up jumper; Lee answers with reverse. The Painters win the tip and we're underway.